Flywheel Hosting Review 2019: 10 Pros & 2 Cons You Need To Know! Flywheel Hosting Review 2019: Best Managed WordPress Hosting? Let’s Find out! When you are just starting out there are dime a dozen of cheap hosting companies that can get you started for as low as $5 per month. But when you are a fully functional online business or blogger or even a developer agency, you have a lot of headaches going on. A single downtime or a backup failure can cost you visitors and hence hard-earned money. This is where managed WordPress Hosting comes in. One of the best Managed WordPress hosting that is officially recommended by WordPress is, Flywheel hosting. Today, we’ll talk about Flywheel Hosting review and see if it is the best managed hosting service out there. This is not a sponsored post at all. I was impressed at what I heard about Flywheel's performance and hence decided to test it myself. This is the most comprehensive, data-backed review by me till date. Flywheel Web Hosting Review 2019: Best Managed WordPress Hosting? 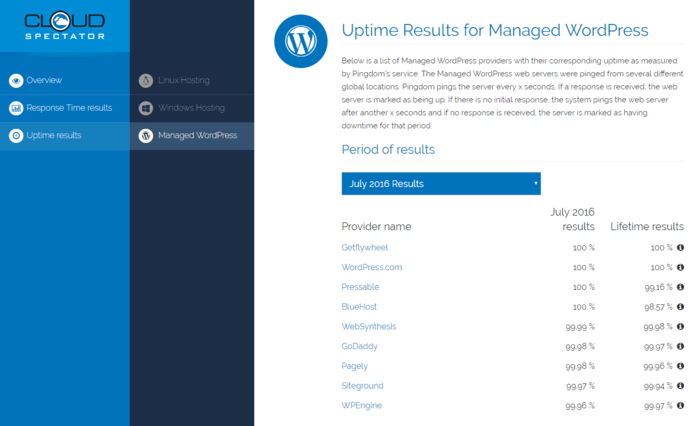 Uptime: What Are Flywheel Hosting's Uptime Rates? Flywheel Hosting Company is the brain child of Dusty Davidson, Rick Knudston, & Tony Noecker in the year 2012. Flywheel hosting is a high-end WordPress hosting based in Omaha, Nebraska in the United States. Flywheel is specifically a hosting aimed towards web designers and creative agencies. Flywheel is one of the most trusted hosting service that is officially recommended by WordPress. The Flywheel team are in the hosting business since 2012 and specialize in best hosting for web designers and client management. They provide top-of-the-class hosting that is wicked speed, simple to use and the biggest thing is they are managed hosting. In managed WordPresshosting, they are obviously a bit pricier than those $5 hosting, but they also take away all the headaches off your head. You don’t have to worry about site updates, regular or daily backups, response time, malware protection, up-time or even caching to speed up your website. The site is the sleekest official hosting site for any hosting providers I have seen. Neat and professional that doesn’t force you to buy them. The account signup page was also clean and minimal and the overall experience of buying an account from them was seamlessly simple. Below is the review of Flywheel hosting based on what it offers, how it compares against Flywheel's competitor hosting sites and my verdict. I will also list the pros and cons of Flywheel web hosting so that you can decide if it's worth the bang for your bucks. Sites hosted on Flywheel are by far the fastest sites that I have come across. This is the sole reason they power sites like Phenomblue, and The Washington Post. These sites are the biggest and most visited sites they show why Flywheel is the reliable hosting solution for high traffic sites. In my testing, instead of checking a new site with no obvious errors which many reviews do by testing a demo site with default WordPress themes, I thought it would be better to test random sites up and running with Flywheel hosting. I checked out various sites hosted on Flywheel managed hosting and recorded their load times and here is one site’s results. I don’t think there anything else to be said here. If you host a site/client site with Flywheel managed hosting you can rest assured that you won’t face any downtime, ever. No visitor loss, no income loss. I don’t want to sound fanboy type, but the ultimate truth is that Flywheel hosting has some amazing features that most of the top well-known hosting payers do not have, yet. Flywheel Hosting is managed WordPress Hosting, which means they do all the labor for you and you just have to focus on what you are good at (your business). They handle everything from site updates, to nightly backups and your WordPress security issues. The beauty of managed hosting is that you have someone at your service, always. In case of site errors, any issues in security or occasional high traffic visits to your site, it won’t get down. The experts at Flywheel are known to provide hosting solutions even on weekends and it is a relief. Moreover, all sites are hosted on VPS hosting, not shared. This definitely impacts positively on your site’s performance both for users and search engine wise. With the proof of 100% uptime (mentioned above) Flywheel has got your back even if you hit the “hug of death” which is getting featured on the homepage of Reddit and thus getting millions of real time visitors on your site. Rest assured the traffic on your special days like events, black friday offer etc can do nothing to your site’s uptime. Flywheel literally places no limit of your pageviews or visits irrespective of the plan you chose. No matter you are on the tiny plan or the enterprise plan, Flywheel has the technology to handle your site even if you get a millions of visits. Have your site hosted on a blogger or another hosting previously? Flywheel has got your back. The expert team provides you hassle-free site migration from Blogger to WordPress or changing of hosting to Flywheel with no extra cost. This is something I wasn’t aware (or rather say i couldn’t afford when I migrated my blogger site to WordPress). With zero technical knowledge, I thought I was done but the broken links still haunt me to this day. I know the pain, and unless you love hassles, you should definitely take advantage of free site migration service. Caching plugins make it easy for your site to handle too many requests with faster loading times. With Flywheel hosting plan (whatever you choose) you get free caching system. They have there own caching technology and why on earth would you pay extra for something when your host can provide it for free. This is the fact I came across when I was looking for ways to cut my WordPress site maintenance costs. I used WP Rocket (the best in the industry) which cost me around $99/year. I now think I waste $99 on something that is offered for free! I can’t stress enough on how important backing up your site is. One single mistake and all your content, important files and everything in between can get hacked/lost forever. There are dime a dozen WordPress plugins for manual backups but the thing is you can’t always rely your whole online business on a third party tool. And who has the time to manage/set those timely backups, check if they are stored onto your cloud or email provider etc. Flywheel provides free nightly backups that backs up everything on your site every night. If anything should go wrong, your site can be restored to bring back to the previous stage, in just one-click. You can sleep sound giving your business on safe hands. Below are some of the features that make Flywheel the best managed hosting for WordPress designers & developers. These features can be useful for anyone, but really make it worthwhile for developers to use it as a platform to develop and manage new client sites. Let’s face it, most designers and WP site developers have to use a demo site on which they can test, show their work to the client. Now, since Flywheel hosting is specifically designed hosting for web designers and creative agencies, you get unlimited demo Flywheel sites for free. They are free for 14 days, but I have heard people get it for unlimited times by just mailing the team (you'll have to test it yourself, though). This feature of Flywheel sites has an advantage for non developers or normal bloggers like me who can use it to test new designs, site features and even try a new plugin out there in the demo site without hurting the user experience on the main blog. Ever hassled how you have to login again and again to the dashboard. Yeah, I hear some spreadsheets rollin’ where you have to manage all your client accounts and passwords. Well. that thing is going to be history because Flywheel manages one-time login with a new re-imagined SFTP which stands for SSH file transfer protocol (read more on that here). The whole process is way lot more easier than coda because you have a bird’s eye view on every account hosted under you. Flywheel makes it worthwhile to share your web design work with clients and team members for collaboration without having to share your passwords or access details. This is seamlessly easy since you don’t have to change your passwords every time a sharing is done. Flywheel makes it seemlessly easy for clients to give feedback easily and the hosting accounts you make for them can be deleted once the deal is over. Unlike other hosting companies, Flywheel is built keeping the best hosting facilities for WordPress developers/designers in mind. You don’t have to pay for your clients and and they don’t have to login to your hosting account to pay for the bills of the newly developed sites. With Flywheel, billing is easy like breeze. You just enter the email of the client after hitting the ‘complete billing button’ and the team at Flywheel will sent them an email which has the billing amount paid in a button click. It’s that easy. You can also revoke access if the client neglects or fails to pay. I personally like how Flywheel has a lot of flexibility added to their plans and packages range. To start with Flywheel pricing, they have a starter plan called Flywheel tiny plan which gets you started at just $15/month (coffee anyone?). The other plans vary based on your traffic requirements and multisite needs. They have plans ranging from $30/month to up to $75 per month which can handle millions of visits (they do have a soft limit of 100k visits but promise not to shut you up even millions of visits, ever). How Much Does Flywheel Cost For Designers? Flywheel is by far the best affordable hosting for freelance developers and agencies. Flywheel's pricing plans start at $100/month for up to 10 WordPress installs, Free Flywheel SSL and WordPress multisite support. $100/month is a no brainer given the benefits and easy client management features of Flywheel. Kinsta Hosting: Kinsta is a perfect Flywheel alternative that hosts your site on Google servers. They're a bit expensive that what Flywheel currently is, but all worth it. Check out our Kinsta Hosting Review. WPX Hosting: WPX Hosting is where I currently host my sites. They're fast, offer amazing managed hosting services and cheaper than Flywheel. Check out our WPX Hosting review to know more. WPEngine: WPEngine is another great alternative to Flywheel that some of my friends use. I currently have no experience with them (& will update this section if I decide to check them out). Flywheel is humble despite the big brand it is and that is how it should be. You have access to the customer care 24*7 and email support is fast and responsive. Here is what Carrie Dils, a WordPress developer and genesis framework expert has to say about her experience with Flywheel. And this one for their customer service priority. Flywheel hosting doesn't sell domains. If you don't have a site, you'll want to first register your domain via your favorite domain registrar like Godaddy or namecheap. Flywheel doesn't provide email hosting which might be absurd for some. But it has it's own benefits. I suggest not hosting emails on the same server. Here's why. 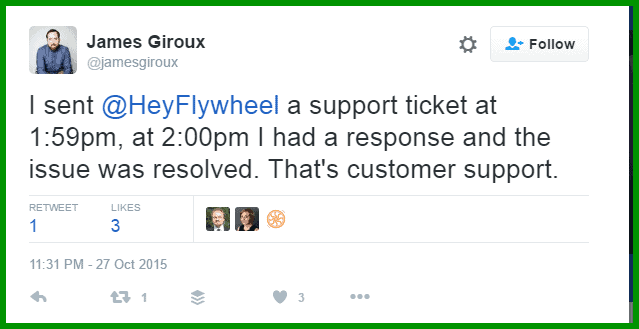 Flywheel hosting review has shown how you can excel by giving your customers the top priority. They have tons of satisfied customers and most high profile developers and freelance agencies trust them with their hosting. The fact that huge sites like The Washington Post are powered by Flywheel Managed Hosting under the hood gives it some solid credibility and positive reviews. Flywheel has zero downtime (100% uptime), easy collaboration & billing facilities. The malware protection guarantee and hacker-free environment will give you enough time to do just what you are good at, business. Moreover they transfer your site along with all data to them with expert supervision and without costing a dime which makes them the favorite of their customers. If you're a website developer or freelance agency dealing with web design clients or a content powerhouse like TWP, you should definitely try them for sure. In my Flywheel review, I found it is the best managed WordPress hosting for designers and agencies. You get free demo sites, easy collaboration and billing facilities and it also takes off the headaches of site updates, malware protection. It is affordable and also provides nightly backups. If you want a hosting that has 100% uptime, officially recommended by WordPress and powers sites like The Washington Post Flywheel is your thing. In my Flywheel review, I found it is the best managed WordPress hosting for designers and agencies. You get free demo sites, easy collaboration and billing facilities and it also takes off the headaches of site updates, malware protection. It is affordable and also provides nightly backups. If you want a hosting that has 100% uptime, officially recommended by WordPress and powers sites like The Washington Post Flywheel is your thing. Informative post indeed! A thorough review about flywheel, which is something new to my eyes! It sure has a lot of good features, and no downtime is the best that one could get. I’m going to forward this post to my better half, so that he can also have a look, if he doesn’t know of it already.